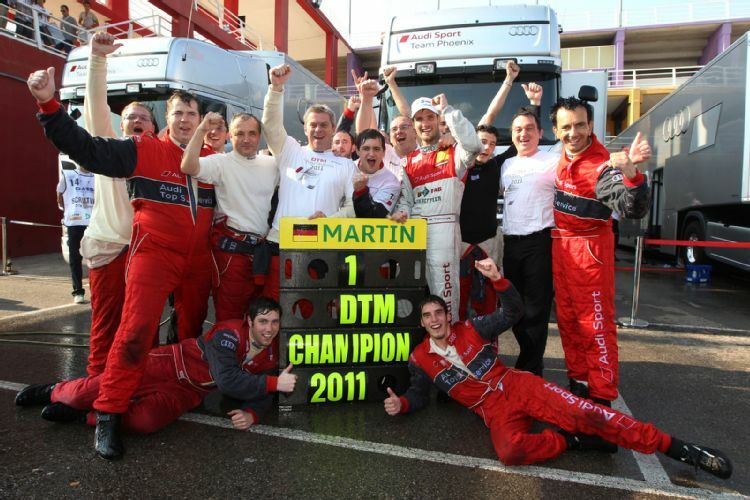 Martin Tomczyk wrapped up the 2011 DTM title by finishing third at Valencia in Spain behind race winner Mattias Ekström (S) and second-placed Portuguese Filipe Albuquerque. With 64 points in the drivers’ standings prior to the season finale at Hockenheim, Audi driver Tomczyk is beyond reach ahead of his opponent Bruno Spengler (Mercedes-Benz, 51 points). “This is just unbelieveable. At the beginning of the season, nobody had me on the radar, and now, I am champion”, the 29-year old from the Bavarian city of Rosenheim said and told his team over the radio: “This title is for you.” With his 2008-spec Audi A4 DTM, Tomczyk became the 12th champion of the ’new’ DTM at the Circuit de la Comunitat Valenciana Ricardo Tormo. Fellow Audi driver Ekström, who scored his third race win of the season at Valencia, was honestly happy to see Tomczyk winning the title: “I have known Martin for eleven years and he has had a lot of bad luck in the past. Now, I am very happy for him.” In front of 16,000 spectators during the weekend, Tomczyk managed to continue his run of success: he is the only driver to have scored points in the nine races held so far. This season, he has won three races (Spielberg, Lausitzring, Brands Hatch) and scored four more podium finishes (Zandvoort, Norisring, Oschersleben, Valencia). Tomczyk will receive the crystal champion’s trophy after the season finale in his native Germany. The tenth and final DTM race weekend of the 2011 season will take place at Hockenheim from October 21st till 23rd. Due to a pending appeal, the result of the ninth round remains provisional from fifth place onward. The decision in the appeal has no effect on Tomczyk’s DTM title.